Roach reproach! – INDIE VOLT! If you’re an independent creator then you’re probably aware of the need to travel cross country to promote your product(s). When traveling out of state a good hotel/motel/inn is a no-brainer for weary travelers. But when you’re a traveler promoting your work or company your room becomes your quasi-headquarters away from meetings and trade shows. Nothing is more welcoming after a 9-hour shift at a convention standing and sitting in the SAME place than your room so the quality of the place you select is essential! Forget for a minute, free breakfast or wifi (IndieVolt staffers just recently stayed at a Red Roof that didn’t feature cartoon network/adult swim in their cable package- and we THOUGHT that was bad!) we’re talking about the things you’d expect, working lights, fresh bed sheets, cleanliness! Unfortunately for Josh Werner while exhibiting at Horrorhound Indy Sept 8-10th little could have prepared him for the grotesque conditions of his room at an Indianapolis Motel 6. Motel 6 started in California in 1962 and only charged $6 bucks a night for a room! 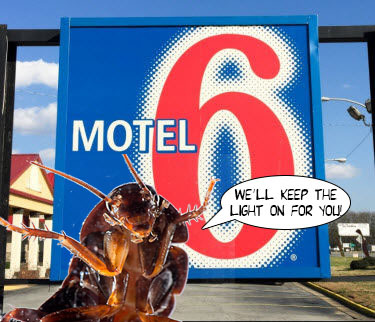 The Motel 6 slogan is, “we’ll keep the light on for you!” Apparently, when that light goes out and the roaches start pouring in, Motel 6’s policies start to become questionable! Check out the video filmed by Joshua on this twitter..
ROACHES! Now to be fair this particular Motel 6 carries a rating of 2 and a half stars when googled and a quick overview of the motel ratings and reports didn’t seem that bad! But Roaches? A reasonable mind would expect THAT to be a CLEAR deal breaker (some IndieVolt staffers watched the video and deemed it Aww Hell Naw worthy!). Creepy, crawly roaches are apparently “no big deal” to the staff at Motel 6 Indianapolis East! Joshua was told that he would not be issued a refund because it was after midnight! So we called Motel 6 corporate ourselves, they refused to speak to us about it citing that we weren’t the attending party aka not Joshua, BUT that the cleanliness and comfort of their guest is an utmost priority to the brand! Now my wife is TERRIFIED of Spiders she’ll cease whatever she’s doing and leave the vicinity at the appearance of Daddy-long legs, and I’ve gone many a sleepless night because I saw a centipede/millipede in the basement..but roaches, we’re not advocating burning the establishment down but Lawd have Mercy! !